This morning Kade came and showed me how loose his tooth was. (It's been loose for at least six months. In the last few days it has been getting more wiggly.) He opened his mouth and I didn't have to touch the tooth to see how loose it was. It was almost sitting horizontal and forward. I asked him if he'd been wiggling it and he said no. He had been eating his (solid) chocolate rabbit. That would explain all the blood I saw at the roots. I mentioned that he might be able to get it out if he pushed it back. Next thing you know...his tooth is in his hand and he had a surprised look on his face. (Wish I could have captured that.) Mickey had come home early to do some packing so he got to witness the excitement. Something he usually misses. A little bit later Kade started crying. I asked what was wrong and he told me he wasn't ready to loose a tooth yet. 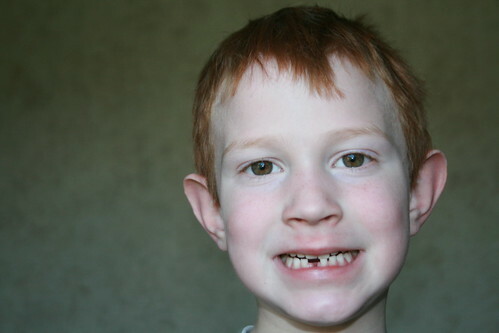 I told him it was just how things go and he'd get a new tooth soon to replace the one he lost. It took him a while to be distracted and get over it. He was excited about putting the tooth under his pillow for the Tooth Fairy. He went right to sleep. Amazing. Wow! What is the tooth fairy going to bring? A new cardboard box to pack up his room with?